Similar to mitral repair, newer methods of aortic valve reconstruction are achieving excellent outcomes with an 85-90% freedom from valve-related complications at 10 years. The goal of this review is to illustrate these newer and more stable techniques of aortic valve repair. Most patients with AI from either tri-leaflet or bicuspid aortic valves are candidates for repair, in addition to selected patients with mixed aortic stenosis/insufficiency and aortic root aneurysms. Initially, aggressive commissural annuloplasty is performed to reduce measured valve diameter to 19-21 mm. Leaflet prolapse is corrected with plication stitches placed in the free edge of each leaflet adjacent to the Nodulus Arantius. In this regard, the leaflet free edge functions as the chorda tendinea of the aortic valve, and shortening with plication stitches raises the leaflet to a proper “effective height”. Leaflet defects are augmented with gluteraldehyde-fixed autologous pericardium, and mild-to-moderate strategically placed spicules of calcium are removed with the CUSA ultrasonic aspirator. Using these methods, most insufficient aortic valves, and many with mixed lesions, can be satisfactorily repaired. Six cases are illustrated in this review, spanning the spectrum of pathologies from annular dilatation without leaflet defects, to standard congenital bicuspid valve with prolapse, to tri-leaflet prolapse, to unusual bicuspid pathology with calcification, to a moderately calcified tri-leaflet valve with mixed lesions, to aortic root aneurysms with severe AI. All valves were repaired using the techniques described above with trivial residual leak and minimal gradients. All repairs have been followed with yearly echocardiography, and valve reconstruction with these methods is now quite stable with excellent late outcomes. Most insufficient aortic valves now can undergo stable repair with minimal late valve-related complications. Greater application of aortic valve repair seems indicated. Management of aortic valve disease with prosthetic aortic valve replacement using either tissue or mechanical valves has been associated with suboptimal long-term results. 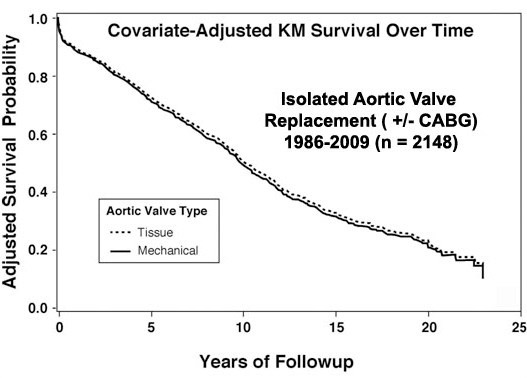 In the Duke series of patients treated with isolated aortic valve replacement over the past 23 years (1), average 10-year survival approximated only 50% (Figure 1), and in most analyses, valve-related complications have occurred approaching a linearized rate of 3-5% per year (2). Risk adjusted survival curves of patients undergoing either tissue or mechanical aortic valve replacement over a 23-year period at Duke University (unpublished data). Notice the approximately 75% survival at 5 years and 50% 10-year survival for the overall population. Mean age at implant was 68 years. 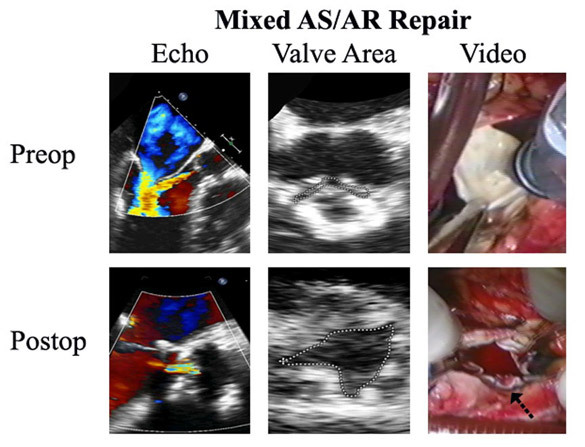 One solution is increasing application of aortic valve repair, but until recently, stable repair techniques have not been available, mainly due to the absence of an effective method for managing prolapse. With the advent of Schäfers’ “plication stitch” for correction of leaflet prolapse (3,4), good long-term results are now obtainable, and virtually all aortic valves with insufficiency can have stable and successful repair with a very low incidence of late valve-related complications (2) (Figure 2). 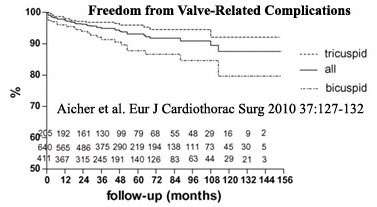 After aortic valve repair in the Homburg-Saar series, 5-year survival exceeded 90%, and 10-year freedom from valve-related complications approached 90%, suggesting possible improved outcomes with aortic valve repair. However, average age and risk factors were lower in the repair series (56 years), as compared to patients in Figure 1, so direct risk-adjusted comparisons will be necessary. Aortic valve repair techniques can be divided into annuloplasty/root procedures versus methods to correct leaflet prolapse and other leaflet abnormalities. Currently, annuloplasty is accomplished with sub-commissural annuloplasty, closing the top 0.5-1.5 cm of all 3 commissures, as described by Cabrol in 1966 (5) (Figure 3). “Commissural Annuloplasty” as modified from Cabrol’s technique. The top 1 cm of all 3 commissures is closed with a pledgetted mattress suture to a measured annular diameter of 19-21 mm. The sutures are placed lateral to the valve annulus and deep into the aortic wall to prevent tearing out. Leaflet prolapse is corrected with central plication stitches, shortening the leaflet free-edge length adjacent to the Nodulus Arantius with simple 5-0 or 6-0 Prolene sutures (3) (Figure 4). Technique of central leaflet plication, as modified from Schäfers’ work. 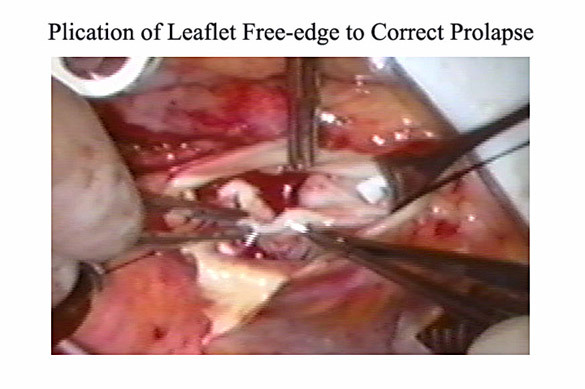 A simple suture of 5-0 Prolene is placed into the thickened free edge of the aortic valve leaflet adjacent to the Nodulus Arantius in order to slightly shorten free edge length. Multiple simple “plication” sutures are placed until leaflet effective height approximates 10 mm. In this regard, the leaflet free-edge functions as a chorda tendinea to suspend the cusp from the aortic wall at the commissures. Shortening the central free-edge (in an area of low stress) raises the leaflet and corrects the prolapse, with good long-term stability demonstrated by Schäfers’ group beyond 10-years (2) (Figure 2). It is also important to emphasize the concept of leaflet effective height, defined as the vertical distance from the base of the leaflet to the top of the central free-edge (6). Raising the prolapsed leaflet to an effective height of 8-10 mm above its base achieves excellent long-term outcomes (7-11). In patients with moderate to severe AI from annular dilatation, often undergoing cardiac surgery for other indications such as coronary or mitral valve procedures, aortic valve repair works well. In a multiple valve repair patient, transesophageal echo shows a moderate central aortic valve leak from annular dilatation, but no leaflet prolapse (Figure 5). Intraoperative transesophageal echo images of an aortic valve with pure annular dilatation and no leaflet prolapse. A simple commissural annuloplasty was the only procedure required to reduce valve leak to trivial. A complimentary intraoperative test is obtained with injection of cardioplegia into the aortic root, and if the aorta doesn’t hold pressure and the heart fills, as in this case, then the aortic root is opened and the valve is repaired. In pure annular dilatation, the leaflets have good verticality without prolapse, but simply do not meet in the midline. The only procedure required is commissural annuloplasty (Figure 3), taking deep bites back into the aorta, and closing the top 1 cm of all 3 commissures with pledgetted mattress sutures to a measured valve diameter of 19-21 mm. Subsequent gradients after this type of aggressive annuloplasty have been acceptably low. After this simple procedure, the leaflets meet better in the midline with good verticality and coaptation area; and during cardioplegia reinfusion, the aorta now holds pressure, and the heart does not fill. On TEE, the residual leak is trivial (Figure 5), and the valve in this patient has functioned well long-term. A bicuspid aortic valve of the common type having plication of the non-fused leaflet, and then fused leaflet cleft closure to raise both leaflets to an adequate effective height and coaptation. See text for details. the valve leak is usually caused by relatively greater prolapse of the fused leaflet. In a typical patient, the leak is eccentric from over the top of the prolapsed fused leaflet - underneath the non-coronary cusp - and tracking beneath the anterior mitral leaflet (Figure 7). Intraoperative TEE of a bicuspid valve undergoing repair. 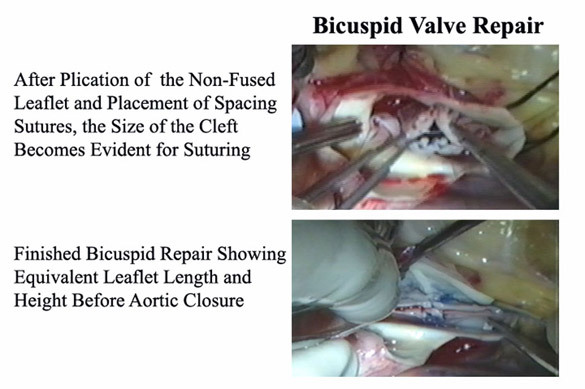 The valve had prolapse of both leaflets, the fused leaflet prolapse being worse (as is usual), and was repaired with annuloplasty, leaflet plication, and cleft closure. Notice the good effective height and surface area of coaptation of both leaflets after repair, as well as elimination of valve leak long-term. The operation is started by performing a commissural annuloplasty of both commissures to reduce valve annular diameter to a 19-21 mm St. Jude sizer. The repair is continued by plicating the free-edge of the (non-fused) non-coronary leaflet to an adequate effective height (> 10 mm) as the reference. Again, the thickened leaflet free-edge acts as a chorda tendinea of the aortic leaflet as it inserts into the aortic commissure, and shortening the free-edge length with simple 5-0 or 6-0 Prolene sutures raises the leaflet to the proper effective height. 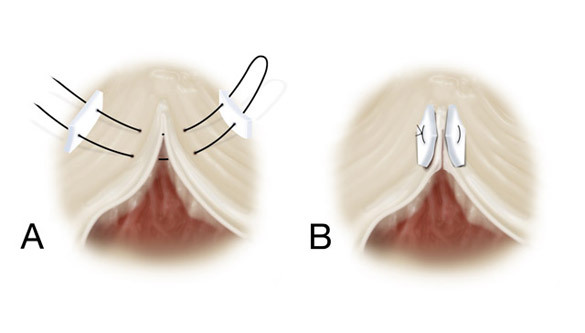 Then a spacing suture is placed equidistant from the commissure in the left aspect of both leaflets, adjacent to the Nodulus Arantius - and another is placed on the right (Figure 6). Now, the excess length of the central fused leaflet is easy to quantify, and this area is closed with simple 5-0 Prolene sutures to make the lengths of both leaflets equivalent. Thus, cleft closure and plication are used to raise both leaflets to approximately the same height and free-edge length. Then as a final step, the heights are fine-tuned with additional plication stitches. The finished repair is shown in Figure 6. Post-bypass, the leaflets have good effective height and surface area of coaptation. The valve opens well, and there was no residual leak (Figure 7). The latest echo of this valve shows stable and continued excellent function 4-years postoperative. At this point, all 3 leaflets are at the same height and meet in the midline. However, so many plication sutures create a rough coaptation surface, and using gluteraldehyde-fixed autologous pericardium, each leaflet is re-surfaced, leaving a small flap in the center to close the central coaptation gap (Figure 8). The pericardial patches are sutured in-place with mattress sutures of 6-0 Prolene, tying the knots in the aortic aspect. The central flap minimizes residual central jets, which can be a problem with tri-leaflet prolapse repairs. The pericardium may also provide support to the leaflet long-term. When tested by cardioplegia injection, the leak then is trivial. The valve opens well by echo – and closes with minimal defect, because of the central pericardial flaps (Figure 8). 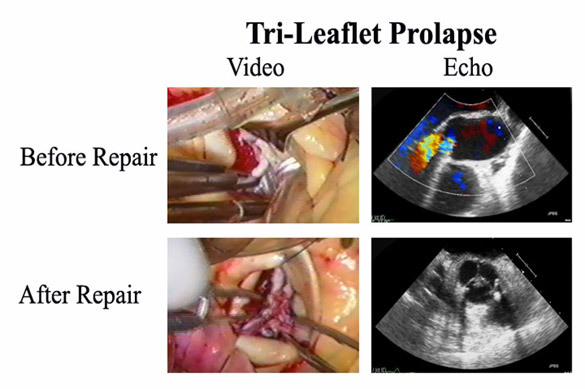 Videos and TEE frames from a patient with severe tri-leaflet prolapse undergoing repair. Annuloplasty, tri-leaflet plication, and autologous pericardial resurfacing were performed, achieving an excellent long-term result. See text for details. 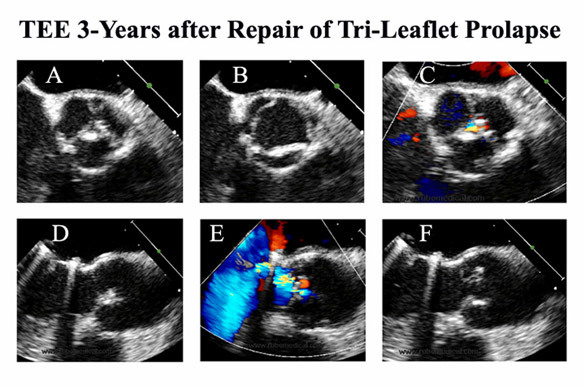 Transesophageal echo obtained 3 years after repair shows stable leaflet position, good closure, excellent opening, adequate effective height, and minimal residual leak (Figure 9). Late TEE in the repaired valve in Figure 8 shows continued excellent function and stable anatomy out to 3-years of followup. As in Schäfers’ larger series, repair failure and requirement for reoperation in our experience has been negligible using these techniques of repair. The next category of aortic valve disease is mixed aortic stenosis and insufficiency. In Figure 10 is an unusual bicuspid valve with fusion of the right and non-coronary leaflets. 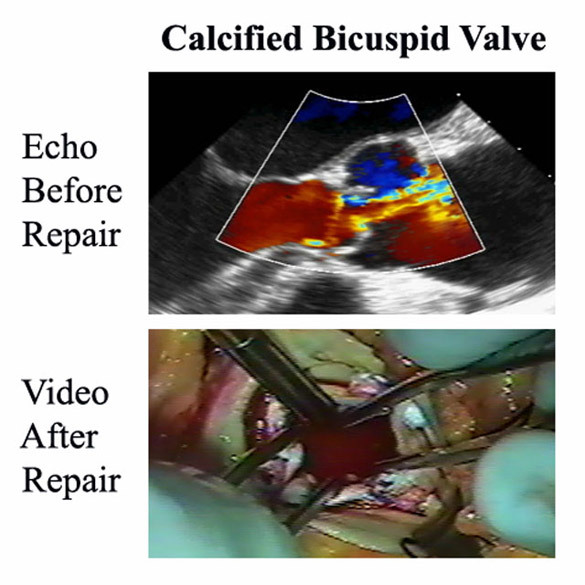 A calcified bicuspid valve in an elderly patient having a triple valve procedure was treated with ultrasonic debridement of localized areas of calcium, together with commissural annuloplasty and leaflet plication. This valve has functioned well long-term, and performance of repair greatly simplified an already complex procedure. The valve has a 25 mm peak gradient and moderate leak, and is repaired as part of a triple valve repair procedure. One would hate to replace a valve with this moderate degree of dysfunction, but it is probably not acceptable to leave it either. Repair may be the ideal option. The right and non-coronary cusps are fused with a chunk of calcium in the raphe, but the non-fused left coronary cusp is fairly mobile. The calcium is debrided from the raphe using the Cavitron Ultrasonic Surgical Aspirator (CUSA) device, improving mobility of that leaflet. Then a minimal annuloplasty is performed, because the valve is small to begin with. At that point, the fused leaflet is lower than the other, and 3 plication stitches are placed to raise it. At the conclusion, the valve opens better (Figure 10), the leaflets are of equal length and height, and they meet well in the midline. Cardioplegia testing shows only a trivial leak, and the patient and valve have done well long-term. Tri-leaflet aortic valves with mixed stenosis and regurgitation can require surgery either as a primary or secondary procedure (as during multiple valve operations). In Figure 11 is another patient undergoing a triple valve repair with mixed aortic stenosis and regurgitation. In another triple valve patient having a tri-leaflet aortic valve with mixed stenosis and regurgitation, the obstruction to leaflet opening was caused by several strategically placed spicules of calcium. Otherwise, the leaflet tissue was good. The calcium spicules were debrided with an ultrasonic device, and annuloplasty plus minimal leaflet plication achieved an adequately functioning valve with much improved leaflet mobility and negligible leak. While ultrasonic calcium debridement should not be used in heavily calcified valves, the technique produces good long-term results in this situation. The AI was moderate, and the measured valve area was 0.4 square centimeters. The root diameter by echo was 19 mm, creating a difficult technical issue. Upon inspecting the valve, the leaflets looked pretty good, with only strategically placed spicules of calcium at the hinge points and commissures limiting mobility of all three leaflets. The calcium spicules were removed with the CUSA ultrasonic aspirator in the left coronary leaflet with only minimal leaflet trauma and improved mobility. The decalcification was repeated in the right coronary leaflet, and finally, the non-coronary cusp. At that point, the valve leaflets met pretty well in the midline, but the non-coronary was lower than the others. A plication stitch was placed in that cusp, which raised it up to the level of the others. However, moving the Nodulus Arantius to the right opened up a central gap. 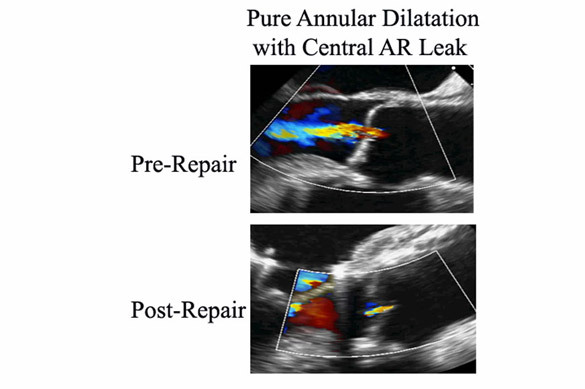 A plug of pericardium was sutured to that leaflet (arrow), limiting the residual central leak, and as shown in Figure 11, the valve now opened quite well. The residual leak was trivial, with a measured valve area of 2 square centimeters. It should be emphasized that CUSA decalcification of heavily calcified valves is associated with late leaflet scarring and retraction, producing insufficiency in a third (12). However, in patients with moderate and strategically placed calcium such as this, moderate CUSA decalcification has been safe and effective, early and late after surgical therapy. Aortic root aneurysms can be associated with severe AI, making valve-sparing root replacement difficult. The first step in the procedure should be an effective aortic valve repair. 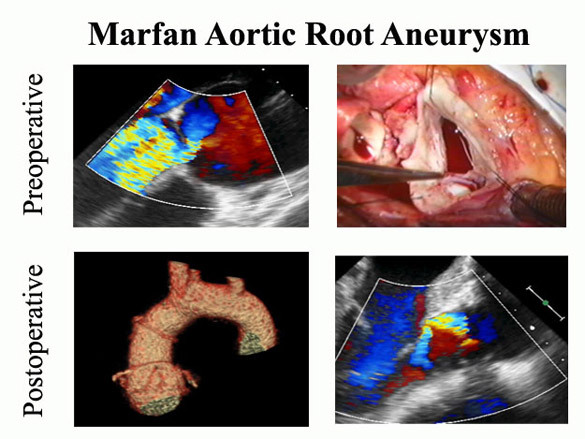 In Figure 12 is a Marfan patient with a 6.5 cm root aneurysm and severe AI. A 36 year old man with Marfan syndrome had a 6.5 cm aortic root aneurysm, a dilated aortic valve annulus, and severe AI (Panel A). Root exploration revealed a torn left/non-coronary commissure (Panel B). 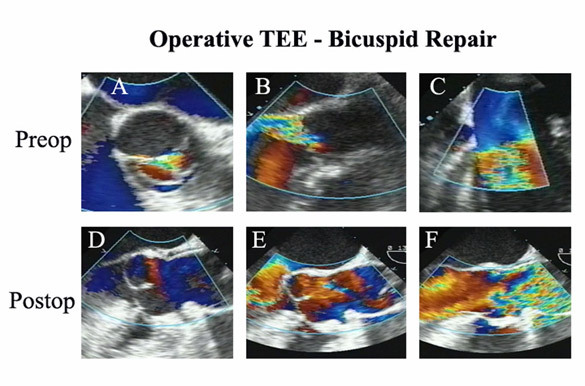 Valve repair was performed with resuspension of the torn commissure, aggressive commissural annuloplasty, and leaflet plication, and was accompanied by remodeling graft root replacement and coronary re-implantation (Panel C). The AI was reduced to trivial (Panel D). The valve annulus was 30+ mm in diameter, but the leaflets sized to a 23 mm diameter valve. * In addition, the left/non-coronary commissure had torn, producing severe valve prolapse. The repair was begun by re-implanting the torn commissure to its normal position with a transmural pledgetted mattress suture. Two levels of commissural annuloplasty then were performed, reducing valve diameter down to 21 mm, consistent with leaflet size. Plication stitches were not required since commissural reimplantation eliminated leaflet prolapse. Without mobilizing the root, the sinuses were excised around 2 mm above the valve annulus. A tri-scalloped DePaulis graft was sutured to the bottom of each sinus, and the suture line carried up to the top of each commissure. As the suture line progressed, the pledgets from the commissural annuloplasty were incorporated, fusing the valve and sinus repair into one stable unit. The coronary buttons then were implanted into the neo-sinuses of the graft. This type of repair has been very stable long-term (2) and is much less involved than a David-type procedure that requires extensive root mobilization. Finally, it important to re-emphasize that all aortic root replacements should begin with a precise and effective aortic valve repair. Addition of an external ring annuloplasty to the procedure has improved results further (13,14), and an internal annuloplasty ring also is being developed for this purpose (15). *By our models of aortic valve and root geometry (16), the normal leaflet free-edge length should be ½ of the corresponding valve circumference. Thus, the leaflet free-edge length should be 3.14 ÷ 2 times the valve diameter – or leaflet length divided by 1.5 predicts the optimal valve diameter for leaflet coaptation. Dr. Rankin consults for BioStable Science & Engineering Inc. – a company developing aortic valve repair devices, including the annuloplasty ring mentioned on page 8.